Jesus had many fans, but not many true followers. There were thousands that followed Jesus around looking for the next big thing –the next miracle or cool handout. But there were few who truly followed Him for Him and what they could do to worship Him and learn from Him –not get from him. In his book, Not a fan, Kyle Idleman hits at the core of fanship. He gets to the root of what a true disciple is –and it certainly isn’t merely a fan. From the first chapter, Not a Fan forced me to look at why I do what I do. Am I guilty of just being a fan of Jesus instead of truly seeking after His heart? Like Nicodemus, we are to be willing to leave our comfortable place and go after Him –regardless. This book was a great read and I recommend it to everyone, even those of you (or especially those of you) that think you have this “Christian” thing figured out. We all need to be challenged to look at our motives and to keep our lives in check. Doing life everyday takes its toll and we can get off track and not even realize it, sometimes until it’s too late. 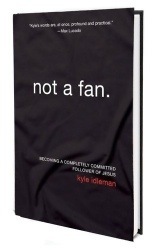 Not a Fan came to me at the perfect time and I looked forward to reading it. I received the book free from Zondervan to read and review and was appreciative that I did. It got me thinking about things in my life that need to be reevaluated and tweaked. Don’t answer too quickly. In fact, you may want to read this book before you answer at all. Consider it a “Define the Relationship” conversation to determine exactly where you stand. You may indeed be a passionate, fully devoted follower of Jesus. Or, you may be just a fan who admires Jesus but isn’t ready to let him cramp your style. Then again, maybe you’re not into Jesus, period. In any case, don’t take the question—Are you a follower of Jesus?—lightly. Some people don’t know what they’ve said yes to and other people don’t realize what they’ve said no to, saysPastor Kyle Idleman . But Jesus is ready to clearly define the relationship he wants with his followers. Not a Fan calls you to consider the demands and rewards of being a true disciple. With frankness sprinkled with humor, Idleman invites you to live the way Jesus lived, love the way he loved, pray the way he prayed, and never give up living for the One who gave his all for you.